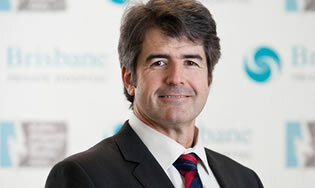 Dr Peter Rowan was educated in Brisbane and received his medical degree from the University of Queensland in 1989. He completed his Orthopaedic training and was admitted as a Fellow of the Royal Australasian College of Surgeons in 1998. He then undertook fellowship training in Hand and Upper Limb surgery in the USA, at Duke University and at Texas Scottish Rite Hospital for Children. Dr Rowan specialises in surgery of the Hand and Upper Limb, including shoulder and elbow surgery, in both adults and children. Dr Rowan is a Fellow of the Australian Orthopaedic Association, and an active member of the Australian Hand Surgery Society and the Shoulder and Elbow Society of Australia. He is a Honorary Visiting Medical Officer at the Royal Brisbane and Women's Hospital and Visiting Medical Officer at the Lady Cilento Children's Hospital. His private practice is based at the Brisbane Private Hospital.